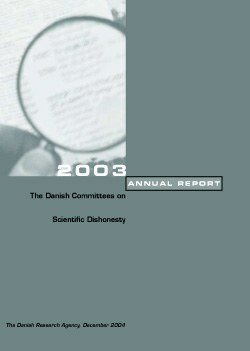 During the reporting period The Danish Committees on Scientific Dishonesty (DCSD) considered or began considering 19 cases, including complaints dismissed. In one of the cases ruled on, DCSD adjudged that scientifically dishonest action had been taken by the researcher being complained about. The researcher in question subsequently requested DCSD to reopen the case. The case is still pending in 2004, therefore. The case that received most publicity in 2003 was the one concerning Bjørn Lomborg's book The Skeptical Environmentalist. DCSD's ruling in this case was made during the previous reporting period, but since DCSD's decision was appealed to the Ministry of Science, which made the ruling in December 2003, the case has been discussed in this annual report.